Perhaps not surprisingly for the daughter of two chemists, this scene from Macbeth was my introduction to Shakespeare. I loved to hear my father recite the charm the three witches crafted 'round the cauldron. It was so evocative of visits to my Dad's lab, where vapor from bubbling pots rose to collapse back into liquid form, dripping steadily into flasks. The sweet-sharp scent of acetone swirled around like mist. Worrying whether the tomato soup heating in a beaker on a Bunsen burner was safe to eat — poison'd I grasped (entrails were frankly a mystery when I was six, despite my kindergarten teacher's attempt to broaden her small town Midwest children's palates beyond chicken and mashed potatoes). Though a confirmed theorist (the only things extracted in my lab are coffee and tea), I still love the idea that you can pull a chemical reaction off the paper and, by boiling and bubbling (along with much swelter'ng and perhaps even a dash of dragon's scale), transform the known into the new and very different. The Chemical Heritage Foundation, where I was a fellow in 2012, has one of the world's largest collection of vintage chemistry sets. The CHF teamed up with developer BlueCadet to develop an app, ChemCrafter, for the iPad that recreates some of the fun of these classic sets, right down to the bubbling beakers, explosions and fires. I played a small part in the development, researching some of the more obscure reactions to be sure of the details of what happened. Among the more fascinating things I learned was that when sodium metal reacts with liquid bromine, there is no reaction until the beaker is tapped (the source I consulted actually gave a minimum required force), then the reaction is explosive. I'm trying to imagine (1) how someone discovered this and (2) what the experiments to determine the force must have looked like! 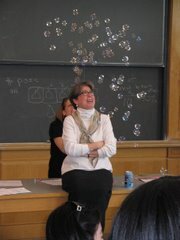 We worked hard to be sure the chemistry was as accurate as it could be (bubbles? fire? color? ), down to the thermochemistry (yes, you can have fun with Hess' law and yes, the enthalpies of reaction and the points you earn thereby are extensive properties). ChemCrafter (after the classic Chemcraft chemistry sets) is free and you can download it for the iPad at the iTunes store. Watch Rosie Cook talk about the Chemical Heritage Foundation's chemistry sets and learn more about the collection here. This is really neat... but why the decision to use wait timers like those annoying facebook games? I read the subtext of the wait timers as proxies for the wait times when you ordered your materials by mail -- but I probably don't play enough FB games to realize they are an oft deployed feature! Great App.Chemical reactions don't simply happen—you need to get them going. 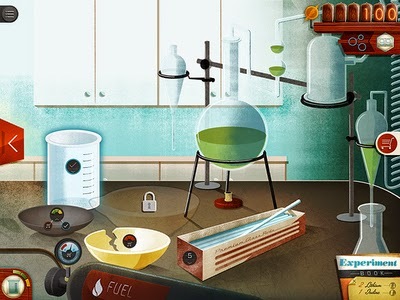 ChemCrafter gives you a chance to manufacture your lab to run fun and inventive investigations. Utilize the Chem-o-convertor to measure vitality discharged and increase focuses that open new investigations, supplies, and chemicals. Utilize your new supplies to specialty more gasses, fluids, and solid. Very interesting post! Knowing that we can connect technology and chemical reactions into an iPad application is just amazing. I believe this is the future of chemical experimentation. Thank you for sharing the article. Hope to hear more from you.